Each chapter begins with a summary of what to expect within the chapter. This is helpful to not only gain a sense of what the reader will be studying but also hints at the main points to focus on. In addition, each chapter ends with a shorter conclusion which not only wraps up each chapter, but introduces the theme to the following chapter. All chapters are rich with examples and applications of theory. Chapter 2, "Critiquing New Media Discourse," begins with an introduction of the events leading to the 2010 midterm elections, the electronic strategies used by the Democrats and Republicans and the newly-emergent Tea Party, and how studying politics in a rhetorical manner illuminates the "relationship between cultural and technological change" (50). Chapter 3, "Interactivity: Its Nature and Functions in Online Communication," offers readers three rhetorical perspectives to studying interactivity. The chapter concludes that "not only do interactivity and online discussion facilitate communication, they also enhance the potential for developing a more informed and attentive electorate" (61). Chapters 4 and 7, "Circulation and Rhetorical Uptake: Viral Video and Internet Memes" and" Anti-Institutional Politics Online: Activism, Hacktivism, and Digital Confrontation," respectively, focus on the definitions and examples of how viral videos, memes, Wikileaks, and hacking-related activity rhetorically affect the political sphere. 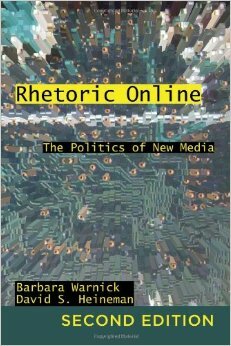 In addition, many pages are dedicated to discussion regarding "Cyberterror," the aesthetics of digital protest, and digital activism. Chapters 5 and 6, "Intertextuality and Web-based Public Discourse" and "Identity, Identification, and Social Media," respectively, offer the richest chapters on rhetorical theory and application. Studying and applying the rhetorical theories of Bakhtin, Kristeva, Barthes, and Burke to the political sphere adds dimension and depth not only to understanding the theories, but to visualizing political discourse in a deeper manner, also. These two chapters will thrill the rhetoricians studying the book.